Bradley has hit the ground running since coming off the disabled list on May 17, hitting .438/.538/.813 in 39 plate appearances. After scuffling in the majors, Bradley has not shown any ill effects since being sent back down to Pawtucket, as he is now batting .360 with a 1.007 OPS in 19 games with the PawSox. Bradley is also seeing time in right field and left field, giving him more versatility if he is needed on the big league club again this season. 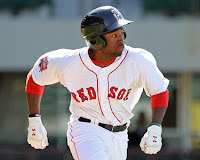 Bradley is positioning himself to be the first call-up if a Boston outfielder goes down with an injury. Coming into last week, Johnson had a 4.01 ERA in 24 2/3 innings, while walking 13 and striking out 20. It was not the start fans were hoping for from the 2012 first-rounder, especially with his conservative placement in Low-A Greenville. Johnson seemed to turn the corner this past week, and in two starts he threw 10 innings allowing three runs on six hits, walking three and striking out 14. He showed better control and also an improved ability to miss bats, both of which are positive signs for the left-hander's development. Johnson will look to build on these positive outings when he takes the mound on Thursday at Fluor Field.